How fresh? We're talking newly-washed, sweet-smelling and still damp from the dryer! It's YA Fresh, a great new site full of author interviews and links to all kinds of teen-lit related people, places and goodies. A fun new interview with me just went up today, so please check it out! Never-before revealed tidbits include the answer to this unseemly question: exactly what would it take for me to renounce my decades-long vegetarianism and consume a bite of human flesh? Congrats to Kelly Parra, author of Graffiti Girl (MTV Books, May 2007) and Tina Ferraro, author of Top Ten Uses for an Unworn Prom Dress (Delacorte, March 2007) for launching this great site, and especially for their awesome-sounding new books! Teen reviews are my absolute favorite kind. So many thanks to Flamingnet for giving real teens the chance to share their thoughts about books! I'm thrilled that WHY I LET MY HAIR GROW OUT was hailed as a Flamingnet "Top Choice," especially because it means I get to post this groovy dragon picture. Hot stuff, right? "...Morgan learned, among other things, that hair grows back and a broken heart does not have to stay that way... For readers who like just a bit of fantasy with their reality, this is a perfect book to read while you are waiting for your hair to grow out. Even if you have no hair issues, you are sure to find this book well worth your reading time. I highly recommend it." Max! Seriously, people, vote for Max! There are some things I should probably be telling you right now. Like about the great teen review of WHY I LET MY HAIR GROW OUT on Flamingnet, or the fact that that Flamingnet, Bookloons and TeensReadToo are still in the midst of their March giveaways — just visit, sign up and you could win a free copy! But I have other fish to fry today. We're in the home stretch here, and I am speaking to those sensible theatre-mad folk among you who (like me) are ADDICTED to "Grease: You're the one that I want!" the reality show that is letting viewers cast the leads of next summer's Broadway revival of Grease. After weeks of heartbreaking eliminations, we're down to the finalists. It's all up to America now, and that means it's time to buckle down and get serious. Dude, it's Max. Max rocks. Max is hot. Max is so totally the One That We All Should Want. So I don't want to hear about how you've got stuff to do Sunday night, or you meant to vote but your cell battery was dead, or (heaven forbid!) you kinda prefer one of those other Ken-doll-like lunkheads who stumble around the stage like they're looking for the exit, or a voice teacher. Take it from me, who's been up to my eyeballs in Broadway musicals since I was, well, younger than Max is now. When you're performing live, eight shows a week, talent is the ONLY thing that counts. Max sings, dances, and acts, he's a total cupcake, and above all he has that magic "stuff." Max is a star. The other fellas are chorus boys, and there are plenty like them (or better) working in dinner theatre right now. Check, please! Previous elections in this great nation have sometimes had less than desirable results, but now it's time to redeem yourself, America! Vote for the right person! Vote for Max! Bookslut interview reveals: the worst brand of baby food ever! For your amusement: I'm interviewed by the charming Chris Zammarelli in the March issue of Bookslut. We discuss book bannings, the writing process, Charleton Heston, Broadway musicals, and the worst brand of baby food ever. Enjoy! I snuck glances at Colin driving as we made our way toward our destination — someplace north of Limerick I think, he’d told me and showed me a map but I was not interested in maps. The scenery outside was pleasant, and we were driving on the wrong side of the road which offered a kind of thrill, but I usually find people more interesting that scenery, and okay-looking young guys more interesting than regular people. So I checked out Colin. Discreetly, of course. Colin was not any older than twenty-two, I guessed, and athletically built, with thick, lightly freckled arms. When he moved his foot from the gas to the brake, his thigh flexed and I could see an edge of muscle moving beneath the fabric of his thin khaki pants. He was baby-faced in a way that might make you think he was pudgy, but there was not one millimeter of tummy rolling over the waistband of Colin’s pants. If a guy has a flat stomach sitting down, these are buff abs indeed. Not that I was planning on scoring a look at Colin’s abs. It just made me think of Raph again. Raphael was very proud of his abs and even kept track of his monthly crunch-totals, but when he sat down there was about a half-inch of roll he could never get rid of. God help you if you noticed it, too. So Colin scored points in the bod department. Unfortunately, his hair color could only be described as strawberry frikkin blond. It looked fine on him, but still. I found it annoying. His stream of chatter had been relentless, and I’d only half-listened since I was busy checking him out, but this seemed to require a response. “No,” I said, after a moment’s thought. Well, I did not. But how would Colin ever find that out? 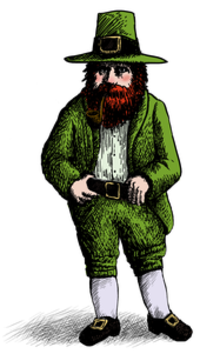 “Don’t you like leprechauns?” I asked, sounding snarky. It's the official pub date (and I do mean pub!) of WHY I LET MY HAIR GROW OUT. If you're feeling the luck of the Irish is upon you, enter the March giveways at BookLoons and TeensReadToo and you might just win yerself free copy! I'm doing a happy Irish jig over some recently-arrived praise for WHY I LET MY HAIR GROW OUT. Read 'em and dance! Many thanks to E., Sarah, the youth of Fredericksburg and the 'Loons! If someone actually has a Snickers bar handy I wouldn't mind one, by the way.